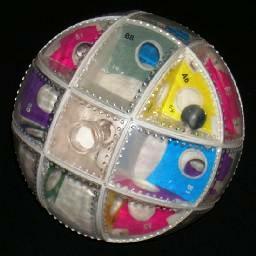 The Im-puzzle-ball is a combination of a Rubik's Cube and a maze. It is a large, ball-shaped, and moves just like the Rubik's cube. Every piece is hollow and has transparent cover. One centre piece has an entrance hole into which you put one or both of the little balls that come with the puzzle. There are holes in the side walls of the pieces, and by rearranging the pieces you can line up the holes so that the ball(s) can move from one piece to the next. Every hole is colour-coded by a sticker on the wall around it. Only when you put two pieces with the same colour next to each other do their holes line up to allow a ball to pass through. The aim is to get the ball(s) to the exit hole, which is in the centre piece on the opposite side of the entrance hole. I will not explain the process of making moves to line up two matching holes, as that is quite easy. The only thing that remains to be figured out is the pieces the balls have to pass through to get from the entrance to the exit. C1 - B9 - C2 - B1 - C3 - B5 - A7 - B6 - C5 - B12 - C6. orange, light blue, red, green, purple, dark blue. A slight alternative goes from B1 to A7 via A3 and B4, using pink and yellow instead of red.